When you first started blogging, did making money from your blog ever cross your mind? Many new bloggers view blogging as only a hobby. It’s not until they generate a decent amount of traffic and develop a loyal following do they even consider monetizing their blog. For some, this journey proves to be highly successful, but for many of us, earning a livable income from affiliate ads, Google AdSense or selling your own product is tough. I’d say give yourself at least 6 months before you start pulling in an income. And even then, it’ll most likely be coffee money. So, what’s a blogger to do? As a blogger, you probably enjoy writing, so one quick way to earn some cash and build a profitable business is through freelance blogging. In essence, you get paid to write for other blogs. How great is that? There are many businesses out there that need content writers, blog writers, copywriters – you name it – to help with lead generation and traffic growth. And what’s great about freelance blogging is you don’t have to wait 6 months to get paid; you can often earn your first payout in as little as a few weeks. Now, the real question is, where do you find freelance blogging clients? I’ve been freelance blogging for over a year now and I’ve found three highly successful ways to land profitable freelance blogging clients. You don’t need a journalism degree – or even formal writing experience – to do this. Truthfully, you don’t even need a blog. What you need is a passion for writing, for knowing how to write for an online audience, the motivation to learn and the determination to go out there and start freelancing. One of the easiest ways to source blogging gigs is to go to a job board. There are two types of boards – free and paid. Free job boards are typically free for bloggers and freelance writers (or anyone really) to browse, but they usually charge a fee to place a job ad. Respond to the ad as close to the published date as possible. You typically won’t land a gig if you respond to an ad that’s more than two days old. Wow them with your pitch email by showing your expertise and relevant guest posts or samples. Did your research about the company or blogger posting the ad. This means you visited their site, read their content and became familiar with their brand. 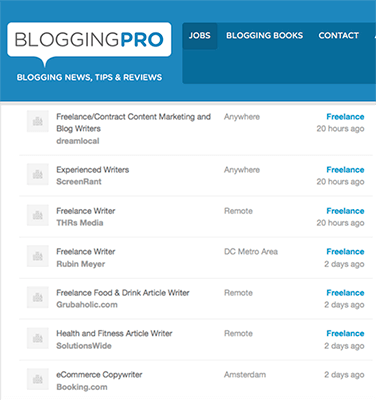 ProBlogger is probably the most popular job board for freelance bloggers out there. The quality of jobs is high – most job ads offer a starting pay of between $25- $50 for an average 800-word post – and there are usually new listings daily. There are a variety of niches advertised, from photography blogging to writing news for a viral blog to even fashion freelance writing jobs. Next to ProBlogger, BloggingPro is another go-to site for many freelance bloggers and writers. They don’t only list blogging jobs, but also copywriting gigs and even print job opportunities. If you want to narrow the playing field even more, consider a paid job board. 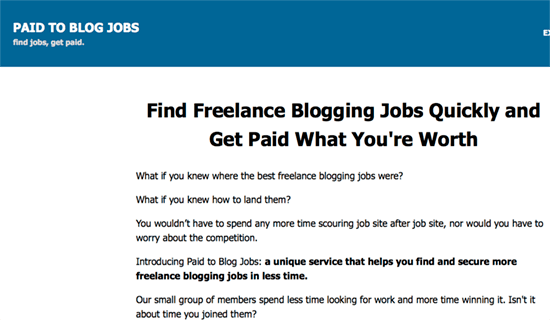 A popular paid job board for bloggers is Tom Ewer’s Paid to Blog Job Board. Tom has a dedicated team that scours the internet curating job listings you don’t typically see on free job boards. This is a great job board for a new freelance blogger who wants to dip their toes into getting paid to write. The bulk of the job ads are blogging gigs – on the lower end of the pay scale – for a variety of niches. 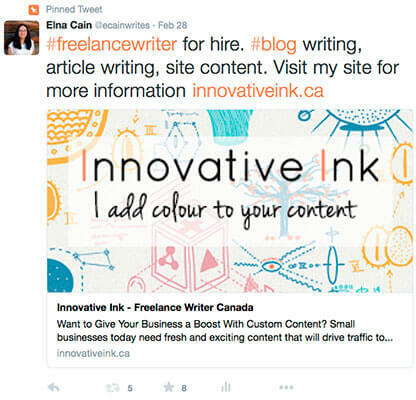 Social media can be a goldmine for freelance blogging work. If you have an active social media presence and network with influencers and other bloggers in your industry, you should have an easier time landing paid blogging gigs. Two places that have yielded me freelance work are Twitter and LinkedIn. There are some easy ways to optimize your Twitter profile to land a blogging gig. Build your follower list – Follow other bloggers and writers as well as influencers in your niche. 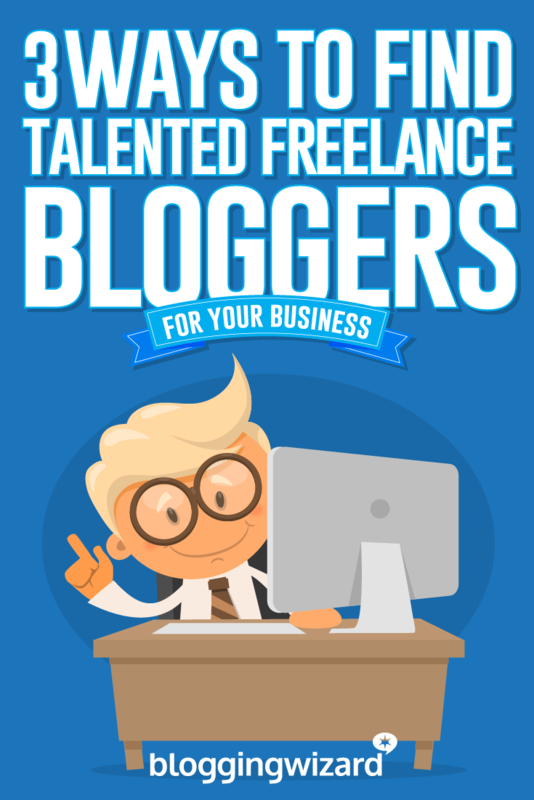 Some popular freelance bloggers are: @sophielizard, @TiceWrites, @kikolani, and @youngprepro. It’s a good idea also to follow potential clients such as small business owners in your niche, entrepreneurs, startups, web design companies, and even local companies. 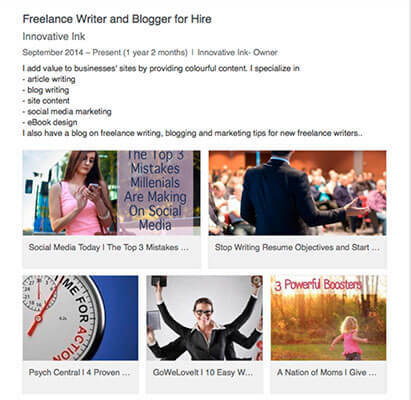 LinkedIn is also a popular place to land freelance blogging gigs. Here are four ways to tweak your profile to attract writing jobs. Fill out your profile – Just as you do for your Twitter profile, make sure to mention you are available for freelance blogging work. 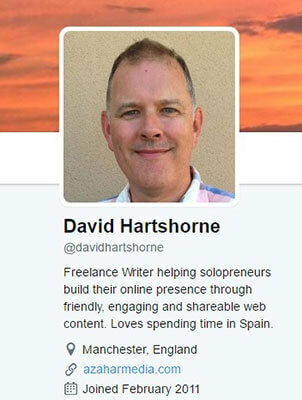 Using, “for hire” seems to do the trick in letting prospects know you are looking for freelance work. In your summary, mention your niches and the type of content you want to write (blog posts, emails, articles, white papers…). Show your sample work – LinkedIn is your online résumé, so show your best guest posts and personal blog posts for others to view. Once you land some paid gigs, include those posts (if they aren’t ghostwritten). Connect with other freelancers – Start connecting with other freelance bloggers and writers. Develop a network of writers in your niche. Sometimes they may be swamped with work and, if you’re on their shortlist of referrals, they just might contact you for a possible gig. One of the best ways to land freelance work is to network and get on the radar of influencers and other bloggers to build meaningful connections. It typically takes time to nurture a valuable relationship with a popular blogger. Just sharing their blog posts isn’t usually enough for them to really take notice. Here is a four-step approach on how to connect with a prospective client with the intention of landing a blogging gig. If there’s a blog you want to write for – and that hires writers – start leaving engaging comments. Make sure your comment adds to the conversation. You can respond to the CTA or add to the post by adding your thoughts or providing additional tips. Good blog owners make the effort to read their comments and respond to as many as they can as a way to develop a relationship with their readers. So, to really make an impact, provide thoughtful comments that relate to the post and comment consistently to get noticed. Blog owners and prospects don’t hang out on their blog all the time; they are often found networking and engaging on social media. As part of your warm outreach approach, start following bloggers you want to work with on Twitter and Facebook. If they have a Pinterest, Google+ or LinkedIn profile, go ahead and connect with them on those platforms as well. Now, just because you follow them, it doesn’t mean they will follow you back. Influencers, entrepreneurs, and other popular bloggers might be selective in who they follow. But, if your outreach efforts are evident, they may follow you back. The prospects you want to connect with probably don’t know who you are. So, at this point, start to share posts from their blog. Sharing on Twitter or Facebook brings up notifications on their profile. This is great for you since your name and picture shows up, creating a stronger connection between you two. Start a conversation by also replying to Tweets, Facebook or Google+ posts. Show the prospect your knowledge in your niche and your easy-to-get-along-with personality. Finally, one way to get on a prospect’s radar is to link to their posts on your blog or mention them in your post. Perhaps, if you’re doing a roundup post, ask a prospect to contribute as a way break the ice and start a relationship. You’ve spent some time warming up your prospects by commenting on their posts, following them and engaging with them on social media. Sending a message after you’ve built a meaningful relationship is an excellent way to put yourself out there. This can be a start to a lucrative blogging gig. There are many ways to earn income from your blog; although not directly monetizing your blog, offering your freelance blogging services is one quick and profitable way. While having a socially-driven blog with quality posts and loyal followers can help prospects find you, most likely you will have to put yourself out there and go and find them. By looking at job boards, optimizing your presence on social media and working on building those key relationships, you’ll have no problem finding the right blogging gig for you. Related reading: 4 Ways Freelance Bloggers Can Avoid Clients From Hell.